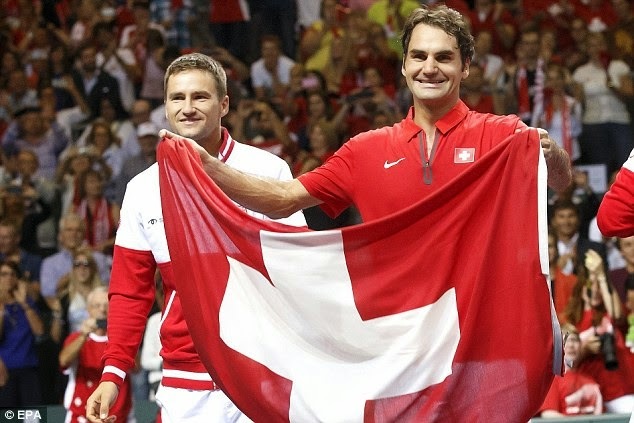 In 2014 Roger Federer won the only title that had eluded him throughout his epic career, helping Switzerland capture the Davis Cup. From 2005 until this year, a small handful of players dominated men’s professional tennis. But this year featured two unexpected first-time Grand Slam winners ranked outside the top-7. Before 2014, the prior 35 Grand Slam champions had been seeded 6th or better. Roger Federer and Rafael Nadal had each won 13 of those 35 Grand Slams, Novak Djokovic 6, Andy Murray 2, and Juan Martin Del Potro was the only one-time winner. This year, 8th seeded Stan Wawrinka broke through to win his first career major title at the Australian Open and 14th seeded Marin Cilic delivered an even more shocking result when he won his first Grand Slam at the US Open. Their breakthrough performances showed that the titans of men’s tennis are more vulnerable now than they have been since they first burst on the scene. This year’s events have prompted some to declare the golden era of men’s tennis over, but the Big Four are far from done. Novak Djokovic won his 7th major title at Wimbledon and finished the year ranked No. 1. Roger Federer led Switzerland to its first ever Davis Cup title to close out the season, and his 73 match wins led the pro tour. Fed finished the year No. 2 in the world. Rafael Nadal won his 9th French Open title in the last 10 years and finished 3rd. Recovering from back surgery, Andy Murray failed to reach a Grand Slam final for the first time since 2009, but he still finished 6th in the rankings. It is also worth noting that Wawrinka and Cilic are 29 and 26 years old, respectively. They had been on tour for years before breaking through. Having peaked so late, Wawrinka and Cilic are unlikely to sustain their recent form. No player born in the 1990s has reached a Grand Slam final or broken into the top 5, so the Big Four should have more time to add Grand Slams to their résumés before a new superstar takes over. 2014 brought tennis to an exciting juncture, as legends added to their legacies while new stars finally showed that they were ready to contend for majors. Here are the year’s most notable highlights. Novak Djokovic compiled a 61-8 record, winning seven titles and finishing 2014 at the top of the rankings. His $14,250,527 in prize money was the second-highest total of all time. Though he only won one major, he dominated the next tier of tournaments to finish with a comfortable hold on the No. 1 ranking. This is the third time in the last four years that Djokovic has finished No. 1. More players broke out in 2014 than any year in recent memory. Stan Wawrinka became the first player ever to defeat Nadal and Djokovic in a Grand Slam when he won the Australian Open. He followed up that win with a Masters title in Monte Carlo and a Davis Cup title, which he won along with Roger Federer for Switzerland. He reached a career high ranking of No. 3 and finished the year ranked 4th. He even passed Federer as the No. 1 Swiss player for the first half of the year. Croatian Marin Cilic was the lowest seeded player to win a Grand Slam in over a decade when he won the US Open. His surprise win led him to a career high ranking of No. 8, and he finished at No. 9. Fellow Croatian Borna Coric, who just turned 18, won the ATP Star of Tomorrow award by being the youngest player in the top 100. His October win over Rafael Nadal made him the youngest player to break into the top 100 since 2003. Coincidentally, the youngster who broke out that year was Rafael Nadal. Nadal’s 9th French Open title in 10 years extended one of the most impressive runs in sports history. No other player has ever won any Grand Slam more than seven times in an entire career. At age 28, Nadal has already established himself as a better clay court player than anyone else has ever been on any surface. His nine French Open titles set one of the most unbreakable records in sports, and if he can stay reasonably healthy, he will continue to put that record further and further out of reach. The rest of Nadal’s injury-riddled season was extremely disappointing, but he should be back and ready to compete for Grand Slams and the No. 1 ranking next year. Extending this record will be high on his priority list. This year’s Wimbledon final was an all-time classic. Novak Djokovic defeated Roger Federer in 5 sets by a score of 6-7(7), 6-4, 7-6(4), 5-7, 6-4. Federer saved two set points to claim the first set in an extremely close tiebreaker. Djokovic stormed back to win the next two sets and take a commanding lead in the fourth. Then Federer saved a championship point and erased a 5-2 deficit to force a deciding 5th set. Djokovic ultimately prevailed after nearly four hours of scintillating play. His rivalry with Federer has become arguably the most closely contested head-to-head battle in the history of professional tennis. Andy Murray’s 3-6, 7-6(7), 7-6(8) win over Tommy Robredo in the Valencia final was the best three-set match of the year. Murray saved five championship points to steal the second and third sets in tiebreakers. The match took three 3 hours and 20 minutes, making it the longest three-set match of the year. It was déjà vu for the two players, since Murray had recently saved five championship points in Shenzhen to beat Robredo in a similar final. But this match was even closer and more exhausting, with more prize money and ranking points on the line. Robredo lightheartedly flipped Murray off after the crushing defeat. Grigor Dimitrov produced more incredible shots this year than anyone else in the world. His absurd trick shots on back-to-back points in Stockholm may have been the play of the year in sports until Odell Beckham Jr.’s jaw-dropping one-handed catch on Sunday Night Football. This point Dimitrov played against Andy Murray in Acapulco may have also been the point of the year. The 23-year-old Bulgarian reached a career high ranking of No. 8 in August, but he has not yet reached a Grand Slam final. Look for him to make some deep runs and climb the rankings next year. Watch out for Japanese star Kei Nishikori as well. At 24, he is the youngest player in the world to have reached a Grand Slam final or a top-5 ranking. The Big Four will continue to lead the pack next year, but Dimitrov and Nishikori are the best young players with a chance to break through in the majors.